It’s the last Friday of the month, which means that yet another month has raced by! Are we really half way through 2012 already?! 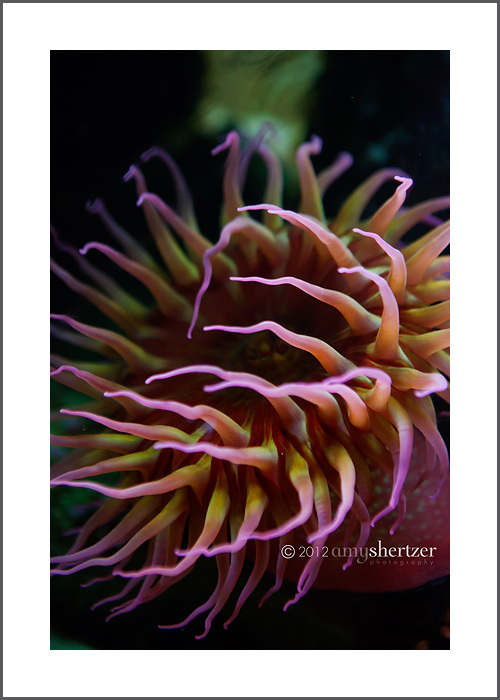 This month, I bring you a fascinating under water animal, the sea anemone. I didn’t even have to get wet, either! This lovely creature was at the Cabrillo Marine Aquarium in San Pedro, California. Now that school is out for the summer, I’ve been exploring some of the numerous SoCal attractions with my boys. This one was a hit, with them and me, so if you’re ever in the area it’s definitely worth a stop. Now, head over to see what Beth Philcrantz, New Hampshire Photographer has in store for today! Love this! I love the movement implied and the colors! Such nice colors. I really like it.